If you are searching for a full-size pickup with the power and towing capacity to handle anything work might throw at you, there may be no better choice than the 2016 Ram 2500. With enough powertrain to make the competition blush, the Ram 2500 is a superior vehicle for those drivers who need durability and strength from a truck. At Lakeland Dodge, we proudly serve patrons from around the Wesley Chapel, Tampa, Brandon, Wauchula, Brooksville, Orlando, St.Cloud, Kissimmee, and Winter Haven areas as one of the premier dealerships in FL. When you are ready to discover a just how impressive the Ram 2500 is, come in for a test drive. Our Ram representatives are ready and waiting. Choice will not be an issue in the Ram 2500 as the pickup comes with three different cab styles a two-door cab, four-door crew cab and a four-door jumbo crew cab ("Mega Cab") and in seven trim options. 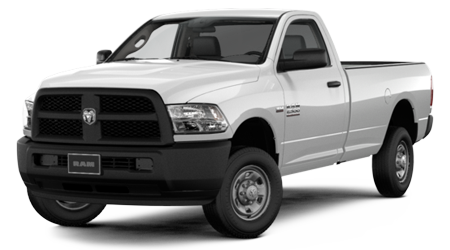 The Tradesman, SLT, Big Horn/Lone Star, Outdoorsman, Laramie, Laramie Longhorn and Laramie Limited all come in various cab styles which might be a little complicated to explain here, but once you come down to Lakeland Dodge, ask our expert Ram representatives for a full trim breakdown. Interior wise, the 2500 Ram offers a cabin fit for a king with soft materials, stylish accents and stitching, and enough room to stretch your legs and get comfortable. Technology wise the Ram uses the 8.4-inch touchscreen Uconnect system to integrate smartphones, hands-free and Bluetooth® capabilities into the cabin experience with ease. Overall, the Ram's interior offers a mix of comfort, luxury and advanced technology to score to huge points with buyers who demand more than just the standard affair from a pickup truck. Describing the 2016 Ram 2500 as an impressive pickup is an understatement. The truck scores points in every major area a buyer might be interested in and with a starting MRSP of $31,780 the Ram also proves to be an excellent investment. Whether you need the 2500 for work or play, the Ram offers everything you'll need to take on life with durability and power. When you are ready to experience the 2016 Ram 2500 firsthand, stop by Lakeland Dodge. Located at 2335 Highway 98 N, Lakeland, FL 33805.